There's nothing like showing off a record-breaker. 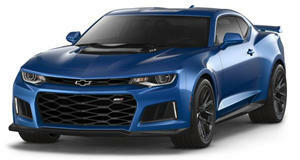 Chevrolet figures this year’s SEMA show in Las Vegas is another great venue to show off its . In fact, on display right now is the very Camaro Zl1 1LE that in only 7:16.04 – some 13.56 seconds faster than the Camaro ZL1 tested last year. Just to give you an idea as to how fast this is, the Porsche 911 GT2 RS, the current Nurburgring lap holder, clocked a time of 6:47.3. Yes, the GT2 RS is noticeably faster, but it also costs an awful lot more money. Power, of course, comes courtesy of the LT4 supercharged 6.2-liter V8 with 650 hp and can be paired to either a six-speed manual or 10-speed automatic. Speaking of which, that 10-speed slushbox with paddle shifters has faster upshifts than the Porsche PDK dual-clutch gearbox. Other features include Brembo brakes with six-piston monoblock front calipers featuring a large ZL1 logo, carbon fiber rear wing, a racing-derived lightweight Dynamic Suspension Spool Valve dampers front and rear, and adjustable front-end ride height. Wearing a set of 19-inch aluminum wheels, a set of Goodyear Eagle F1 Supercar 3R tires are standard. In fact, they contribute to a maximum lateral grip of 1.10 g.
Thanks to these lighter wheels and dampers, as well as thinner rear glass a fixed-back rear-seat, the ZL1 1LE weighs 60 pounds less than the ZL1. As far as interior creature comforts go, passengers will enjoy automatic dual-zone climate control, a Bose premium audio system, heated and ventilated front seats and a heated steering wheel.